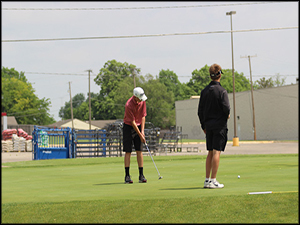 The Rose Hill Golf team, like other sports, is having to field a team of young players. They have a total of 11 golfers with one of them being a junior and the rest being underclassmen. However, the team and coaching staff is not discouraged at all. Head Coach, Mathew Browning said, “My expectation is that Noah Loecke asserts himself as our number one player and scores consistently in the low to mid 80’s.” Loecke is the leading golfer on the team. Due to the team being young and short in numbers, individual coaching will start to take place. This will be huge for Coach Browning to really help his young players get better. He believes the team will improve during the season and be able to compete when it counts. Their first meet will be on Monday, April 1st in Andover. The Rose Hill Girls swimming team is down in numbers this year. After last season, they lost four seniors and a few more underclassmen. With that said, however, the squad they have is quite the hardworking group. Head Coach, Tessa Downs said, “We have a lot of work to do if we want to make it to state but all these girls are willing to work hard.” A strong senior class including Ana Leiza Castilho, Savannah Kiser, Kallan Lucas, and Kennedy West leads the team. Kiser and Lucas have been four-year swimmers for Rose Hill. Their leadership will guide the team through practices, as they make sure the work ethic is through the roof. The rest of the team includes, Tori Kaiser, Elle Debbrecht, and Sara Baden. The ladies first meet will be on Friday, March 29th at Wichita Heights. 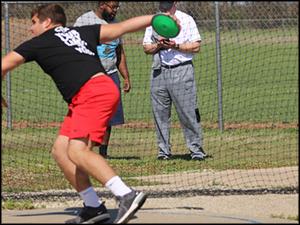 The Rocket track and field team has big numbers going into the season. Coach Barger said, “We have the most kids out since I’ve been the head track and field coach.” They are currently at 75 total athletes, boys and girls. The numbers are split into 50 guys and 25 girls. With two participation meets at the beginning of the season, the coaches are excited to watch the entire team perform early. Overall they are a young group but high numbers brings a competitive atmosphere during practice. With that competitive drive, they should improve a lot as the season progresses. Their first meet will be Tuesday, March 26 in Mulvane. The Rocket softball team has underwent a change in the coaching staff. With a new head coach, Dani Arnold, the team has high hopes heading into the season. Despite a problem with low numbers, they have a well-rounded group of returning players. Several of them had All League honors including Sydney Adler All League First Team Pitcher, Emily Adler All League Second Team Shortstop, Aspen Goetz All League Honorable Mention Catcher, and Kylee Dunn All League Honorable Mention 1st base. Senior, Emily Adler said, “I think we have a chance to do very well this season. We have a group of very strong athletes that can compete at a high level.” To reach their potential, there is still hard work that needs to be done. Their first time competing will be at home against El Dorado on Monday, March 25th. The doubleheader is set to start at 4:30 pm. 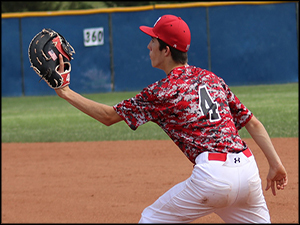 The Rocket Baseball team had a rough season last year; however, that wasn’t always the case. From 2014-2017 they had a record of 62-32 for a .660 winning percentage. Another strong suit they had was postseason success. For three straight seasons (14, 15, and 16) they placed 3rd at the State Tournament. Needless to say, Rose Hill baseball knows how to be successful. To get back in the groove of winning, they will hit the basics hard. Coach Carr said, “We have worked extremely hard on the fundamentals and their knowledge of the game. With that said, however, our main goal is to make them mentally tough and down right competitive.” With the majority of the team still being underclassmen, they have a lot to learn about the game of baseball. Their first matchup will be against El Dorado on Monday, March 25. 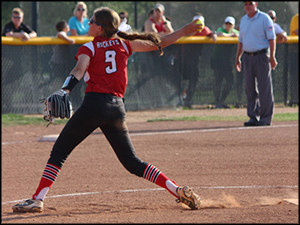 The Lady Rockets have gone through a three-year rebuilding process. On paper they haven’t had much success, however, they have built up key players to propel them this season. They are a young team but that will not discourage them while on the field. The seniors leading the way for them are Reagan Evans, Andie Keefer, Ashlyn Parkey, and Gracie Vaughn. Other key players include Josey Johnson, Korryn Hackney, and Lexie Rose. With that said, however, it will take a team effort in practices and in games to be successful. Head Coach Matt Henderson said, “I am encouraged by the commitment and hard work the girls have shown already. 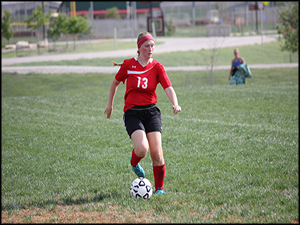 I am excited to watch them grow into their potential as the season progresses.” The girls are a well-bonded group and will use their chemistry to assist them on the field. Hopefully everyone stays healthy and it should be an exciting season for the Ladies. “Confidence comes from preparation“ is one of the greatest quotes from Dan Gable. This quote defines the 2018-2019 Rocket wrestling team. Countless hours of off-season work was put in by these men to prepare them for the season. Team chemistry was one of the key components they had going for them. The wrestlers in the senior class were great role models for the younger guys. The bond the team has created will last a lifetime. They also had quite the accomplishments throughout the year. Out of the nine tournaments they competed in, they placed top five in five of them. They also topped off the year with an undefeated League Title run. This was the second year in a row that they won the league title. The Rockets took seven wrestlers to the State Tournament, the most since 1997, and placed 13th. Qualifying for the state tournament but not placing were Keegan Beavers, Peyton Besco, Cole Daughhetee, and Clayton Epley. Three of the seven placed including Kyle Sackett, David Leck, and Grant Scheer. In addition to placing at State, these wrestlers also compiled 30 win-seasons for themselves: Kyle Sackett (34-3), David Leck (40-3), and Grant Scheer (30-7). The memories that have been shared throughout this family will last forever. Despite the team losing the senior class, they will continue to put in hours of work with the coaches to prepare for next season. Zac Sparr, who wrestled for the Rockets from 2006-2010, is the current all-time wins leader for the Rockets with a career record of 130-16. However, David Leck will return for his senior season having already earned a career record of 106-27 meaning that 25 wins will make Leck the Rocket’s all-time leader in career victories. 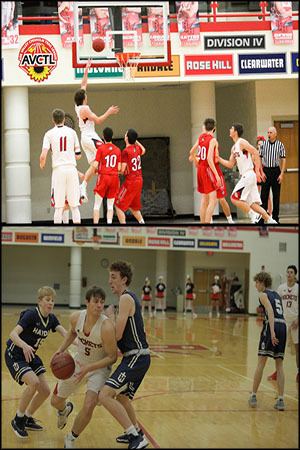 The 2018-19 basketball season was a highly successful year for both the boys and girls programs. 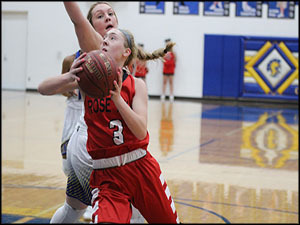 The Lady Rockets started slow losing the home opener against Circle. Rather than getting down on themselves the ladies turned things around and battled to win the next nine consecutive games. Starting the season 0-1 was quickly forgotten following the 9 game win streak that tied the 9-0 start of the 2008-09 season. As well as having an exceptional win streak, the Lady Rockets also added to the many seasons of winning teams in the past fifteen years. To go along with a winning season, the Rockets also saw incredible performances from several players. Senior Emily Adler played every game having ten or more points. As well as having high scorers the Rockets also had several “piano pushers.” Everyone contributed defensively to give the team the best chance to win. Every game the Rockets grew together as a team and played better and better as a unit; it was highly beneficial of the success or failure of the team as the post season approached. Despite making strides as a team the Lady Rockets struggled on the boards and eliminating second chance shots. This would prove to be the downfall of them despite their hard work. Although the Rockets had a chance to make it far, it unfortunately came to an end sooner than anticipated. This year’s team saw several young players get in and get valuable exposure at the varsity level, which in theory will transfer into future seasons to give the Rockets even more success as they continue into seasons to come with new players. Team chemistry is one of the most important components to a successful team. This Rocket basketball team was a prime example of a team family. Countless team dinners and hangouts outside of practice were some of their most cherished times together. How their season ended does not measure how truly successful this team was. The success was there though as the team finished 13-8 for their best record since 2009-10 season. They also broke the team record for fewest points given up all season with 970 for an average of 46.1. The way they played on the court, acted with each other, and handled themselves around school is second to none. Having seen them play before, their grit and determination to win is exhilarating. Without fail, you could count on Konner Barron hustling for a rebound, Dalton Rapp putting up a three, or even Koby Campbell displaying his skills and knocking down baskets. Needless to say, they were a fun group to watch compete. If you ask the players, the season wasn’t what they wanted, but when you look back this team may be the reason this program turns around and that is something which they can all be proud. They will be losing five seniors including Konner Barron, Brian Firebaugh, Ian Liechti, Dalton Rapp, and Brady Koenigsmen. With that said, however, things are still looking positive for the team in the future. Returning starters for next season will include Campbell and Spencer Nolan. Several other players who received playing time off the bench will be expected to step up as starters. As always, they will be fun to watch on Friday nights next winter. The Rose Hill swimming team is looking very promising for the future. They are only graduating one out of eleven swimmers. However, that one happens to be a state qualifier and team captain, Hayden Kalp. Kalp was an excellent swimmer and an even better role model for the team. They didn’t place as high as they wanted at meets, but they are a very young team. Returning swimmers next season will include Adam Herndon, Riley Riebel, Timothy Hoops, Bryce Bischler, Zach Hoang, Tyler Ivy, Drew Leck, Tristan Calef, Rylan Barger, and Landon Rutledge. 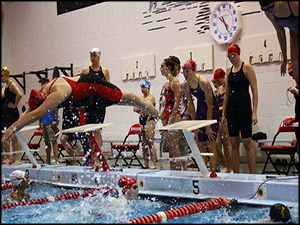 With ten experienced swimmers, the 2019-2020 Rocket swimming team should show lots of improvement and be something to talk about come next winter. There is a great amount of excitement heading into this wrestling season. Last year ended on a positive note and that translated into a lot of offseason work. Many wrestlers joined our local Punishers wrestling program during the spring, summer and fall. We had wrestlers attend summer camps from Stillwater to Iowa City to Minnesota. We currently have 32 wrestlers on the roster, making this one of the biggest teams we have ever seen at RHHS. Our wrestlers have spoken about a potential top ten finish in the state and the goal of winning another league title. We have three returning state qualifiers and/or medalists in Kyle Sackett, David Leck and Grant Scheer. Only a junior, Anayka Besco has already won two medals at the girls’ state tournament, which includes a state championship in 2017. We also have a strong senior class, which has shown great early-season leadership. As great as all this sounds, it means nothing if our wrestlers don’t continue to develop their skills and keep their competitive edge. We start the season off with a tough tournament so we’ll soon find out where we stand in the state of Kansas. We have several seniors returning which gives us great experience. We have 5 seniors in our program all five of the seniors have played since their freshman year and know what our culture is and how we operate. This has given us a great head start to our year. They have set the tone for the start of our year and we have yet to have a bad practice thanks to their leadership. We want to continue working hard everyday in practice, if we give everything we have during our practices once the games start we will find success. We like our team heading into the season. We have a lot of experience returning. Heading into my fourth year here the girls have a good sense of our expectations and what style we are trying to achieve. Offensively we should be able to hunt good shots and have a balanced attack. At most times we should have multiple kids on the floor that can shoot the ball and spread you out. Defensively we will need to use our athleticism to get out and pressure other teams in order to steal some easy baskets. The one area that will define our season will be rebounding. If we find a way to compete on the glass then we have a great chance of having a successful season. We have a lot of new faces on this team and we have a lot of hard work ahead of us. But like they always do, this team will continue to surprise everyone. I think our first meet (Maize) will be a hard one. There are a lot of teams invited and it will be packed and very slow but it will be good to get some times down on paper and see where we are at. The best part about swimming is that we aren't truly racing others, we're racing ourselves, and against the clock. Each time we swim we have to be a better version of ourselves, we can’t just get up and play the same way we always have and be great. We have to work harder and harder each time to get where we want to. Even though the Lady Rockets had to adjust to a new Head Coach, Cherith Mock, they still proved to be a leading force in Kansas 4A Volleyball. 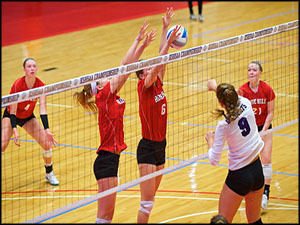 The Rose Hill Volleyball team has been one of the top teams in Kansas for the past three years. The dominance they brought to the court sparked when this year’s senior class got the opportunity to be on varsity. They were back-to-back state champions in 2016 and 2017. Since the seniors have been in high school their record has been 139-29. The list goes on and on of their accomplishments. However, the most inspirational part of this team is their leadership and attitude on and off the court. The extremely talented and encouraging senior class sets the examples for the younger girls on the team. The team had high hopes going into the season. Even with a big target on their back, they did not let that distract them. With that said, however, the outcome at state did not equal out to their potential. They were ranked within the top five of the 4A team rankings throughout the season. Going into the state tournament they had an impressive record of 31-6. The team had a rough draw with seeding and ended up not placing. Despite how the season ended, the ladies battled through every set they competed in. This group has had a lot of heart since the moment they stepped on that court and it has shown through every match. 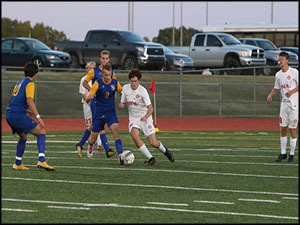 The Rose Hill soccer team did not have the season they were hoping for. It started out pretty rough having a record of 1-8. That record lit a fire within the team, as they would finish the season 7-10. The improvement of the record goes to show how much heart and motivation this team had. A very talented and respected coaching staff including, Jerry Treat, Phil McNany, and Brent Nussbaum guided them towards success. Coach Treat is one of the most respected coaches in the state of Kansas. The senior class also helped out tremendously by being great role models for the young team. If you looked at the team, you couldn’t help but notice the amount of underclassmen that were on varsity. This is a huge motivator for the team and staff, but they will still have to work very hard in the offseason. They are a talented, now well-experienced, young team with a bright future. I am looking forward to hearing how this team makes a name for Rose Hill soccer again. The Rocket cross-country team, both girls and guys, performed very well this year. They were full of young talent but fell short in the number of seniors. The three seniors leading the way for the team were Trent Nusz, Cole Wagner, and Aitana Vicario. Trent was one of the leading runners throughout the season and was also one of the state qualifiers. He also held the fastest 5K time for the team at 18:11.61. Accompanying Trent at state was Sophmore Aubrie Thomison. She also held the fastest time for the team at 21:44.73. 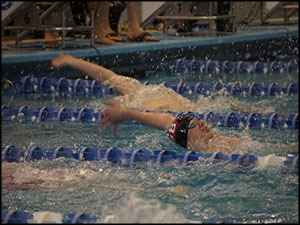 The team had seven meets they competed at and did fairly well at each of them. They always had a few runners within the top 25, which is a great accomplishment. They are going to be a solid team next year with a senior class of 12. Coach Barger will encourage everyone to stick with it and work hard during the off-season. 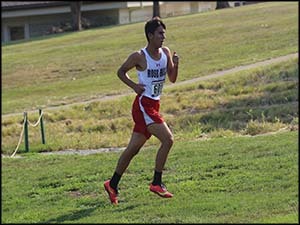 If all the pieces fall in the right place next year, it will be a great year for Rose Hill cross-country. 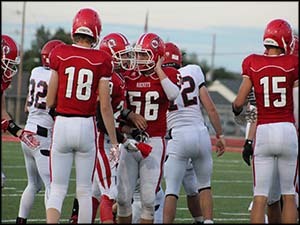 Going into the season the football team had high hopes with changes to the coaching staff. They put in countless hours during the summer to prepare themselves. The team also had a solid senior class to help lead and set good examples for the underclassmen. All the steps seemed to be in place to be great and experience success. However, as the season ended the team compiled a record of 1-8. As life would have it, the young men faced several situations of adversity throughout the season. Senior Rylan Hingst had a heartbreaking injury during the first quarter of the home opener that put him out for four games. This was very detrimental to the team as Hingst was a starter on both sides of the ball. As other injuries came about certain underclassmen had to step up and play. With lack of experience, the young kids had to fight every down to hold their own. Regardless of their record, the team created a bond that will last forever. That is one of the great aspects of football that is overlooked, unless you know the feeling of course. The senior class alone has been teammates on the field and best friends off the field since 1st grade. 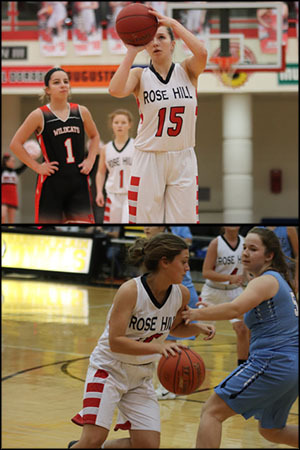 The seniors will be missed quite a bit due to the impact they have had in Rose Hill. They haven’t had the best high school career in football, but they stuck with it showing great pride in their school. This class took on the role, with great attitude and character, of being the foundation setters for the years to follow. Speaking of, the underclassmen have talent, size, and an outstanding work ethic to set them up for big things next year. Coach Weber will make sure they are well-oiled machines going into the season. I look forward to hearing about the success of Rose Hill Football in the years to come. The Rocket Volleyball team is looking to make it three state titles in a row. Despite having to face some adversity by losing a very good senior class, their goals will not change. 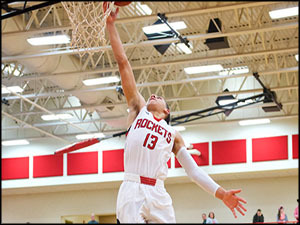 The Rockets have four returning starters that know what it takes to reach the top. “We’ll have a good team this year but some of us will need to step up to fill the missing roles from last year”, said Senior Gracie VanDriel. The team also took on a change to the coaching staff by adding a new Head Coach, Cherith Mock. Their first game is on August 28th against Collegiate and Buhler with Collegiate hosting. The Lady Rockets will be working hard as they attempt to defend their Back-to-Back State Championships! 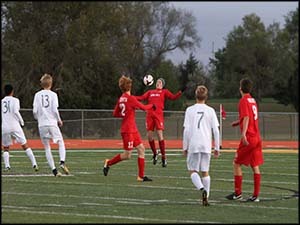 After a season ending shootout last year, the Rocket soccer team is determined to have a much better outcome to this coming season. “Expecting to have a good team with seven returning starters, with the majority of them being sophomores”, said Coach Treat. The team has put in countless hard working hours in the off-season to prepare themselves for the field. With Coach Treats’ history of success and the player’s will to succeed, the future is very bright for this young team. To start off the season, they will take on Coffeyville at home on August on 24th. 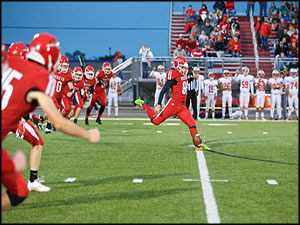 The Rocket Football Team has taken on major changes since last season, including a new Head Coach, Lee Weber. Coach Weber also added four new coaches to the staff that are experienced and talented. “The coaches have bought in to us and the team has bought in to the coaches”, says Senior Konner Barron. The Rockets fall short in numbers with their underclassmen but make up for it with their upperclassmen. On the field, however, they are stacked with several returning lettermen on both sides of the ball. “Offensively, we will need to be efficient, play at a deliberate pace, control the ball and pace of the game to be successful”, says Head Coach Lee Weber. In the trenches, they will be at a size disadvantage but they will not shy away from the challenge. Their first matchup is against Clearwater at home on August 31st. The ceiling is the limit with this hungry team as they aim for their most successful season in several years. We are still looking for runners at this point. We should have a better season than last year. Our first-year runners from last year have experience now and should contribute more this season. 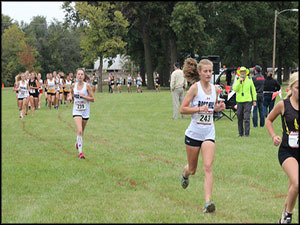 We also have a remarkable amount of younger runners that are eager to contribute at the varsity level right away. Our first meet is one week away and we are just now trying to get some of them in shape and their endurance levels up. Our training will be guided to excel in the three big races, league, regionals, and state. We had some runners that really worked hard this summer and it is paying off as there are not that many injuries at the beginning of the season and they are stronger runners. The team will travel to Clearwater on August 30th for their first meet of the season.